Yesterday I had some little spare time between two projects so I decided to train myself at using Meshmixer and Sculptris. I had no precise idea of what to do before I reminded a famous René Magritte painting from 1934 that would be a perfect subject for Meshmixer. Along with a bit of Sculptris, I thought it should be possible to achieve a good result in a short time. The first thing to do is to find a good picture of Magritte's original painting. I could have open one of my art book but thanks to some web search it's easy to find a good reference picture in just a few seconds. Meshmixer's main feature is to mix meshes. And this feature makes it a unique 3D app : I know no other app that offers such a feature. For the head I already had an open-source model but I don't remember where I downloaded it from... But any good female face should do for this project. This base mesh I then exported as OBJ for a future use in Meshmixer. For the new "body face" attributes I simply deleted everything from the Pink panther body mesh except the front part of it (showed in blue) and exported it as another OBJ. 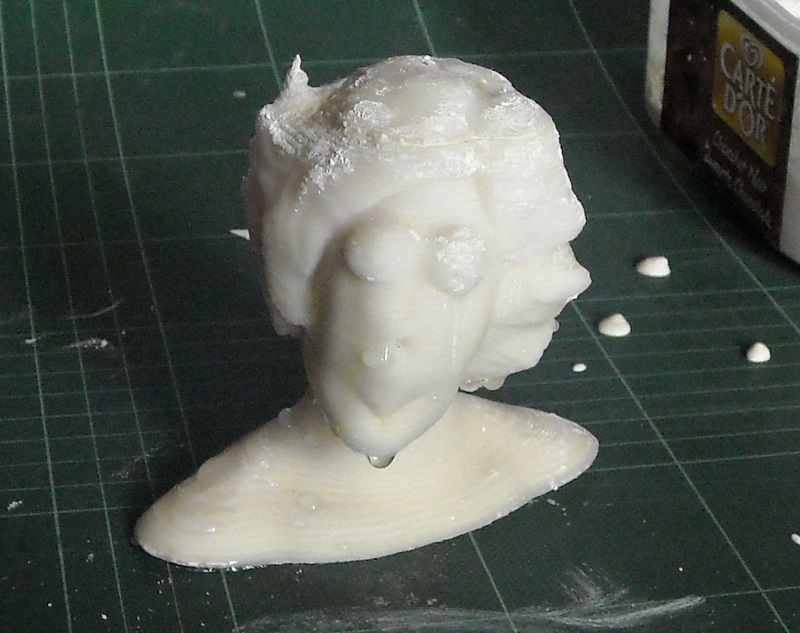 For the making of the hair I simply deleted everything from the Beethoven's bust except its hairs (showed in blue). Again I exported the result as OBJ. This is done within Meshmixer. But before I roughly aligned my 3 different "ingredients" just to check they could do the job. Then I first imported the OBJ "body face" mesh into Meshmixer and converted it into a Meshmixer part. This intermediate result is then again exported back into a new OBJ file. The previously exported OBJ and the OBJ hair mesh are then imported in SketchUp. I then deleted all unnecessary faces (back of the head), aligned the hair and connected the shells together. 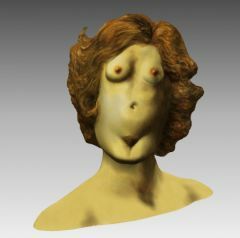 The result is again exported as a new temporary OBJ file for further sculpting in Sculptris. I then imported this last temporary OBJ in Sculptris and sculpted some details that will make it look closer to Magritte's original artwork. This final mesh is then exported from Sculptris and decimated for 3D printing. Just to push the fun a bit further I decided to texture it. To do so I just reused the photo of the original painting as a texture. I haven't tried to print it yet because I didn't have time. But when it will be done I will post a photo of the sculpture here. So this morning I printed the missing top part. Having two parts to glue together, and the main part being hollow, I decided it might be a good idea to fill it with plaster to make it heavier before to glue the top part. So I prepared some quiet liquid plaster and poured it into the bottom hollow part. I also added two screws to the top part that will help holding it in place when the plaster will harden. The excess of water in the plaster starts to "sweat" - "No woman no cry !" The sculpture is "heavy" which offers a good "feeling" and it can stand by itself. So I'm very happy with the result. Now I have to wait for it to dry (which might take a long time regarding it's air tight) before cleaning it with a little bit of sanding and offering it to my friend Dan. Честито рожден ден, Дан ! Print one for yourself ! If you do, you can print it for yourself : just download it from Thingiverse.